Why do I like it when there has been a lot said about that crazy new user interface? First, the performance is great. I built my desktop machine in 2008. It has 8 gb of memory and while my excessive tabs in Chrome browser were slowing me down, the machine itself felt a bit slow. Until, I upgraded to Windows 8. 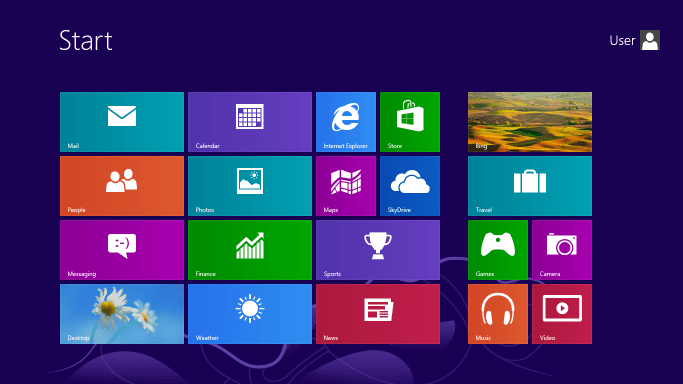 With Windows 8, the UI felt fast again. To quantify, it didn’t feel like I suddenly got a much faster machine but I noticed and appreciated the performance improvements in speed and memory utilization. YMMV. For myself, I do not miss the Start button. I didn’t use it that much. And, occasionally, going to the main Win8 NUI to find/do something. Btw, the shortcuts mentioned by Hanselman in this blog post are very useful (Win+I and Win+X). Dual monitor support – independent backgrounds, taskbar enhancements and keyboard support to move apps is very nice. Btw, get the Bing Dynamic theme and you’ll have the amazing Bing.com pictures as your background. Task manager – There’s been a lot of nice improvements in the Task Manager. Read this post to learn how to use the Win8 task manager. File Copy – The file copy dialog *seems* more accurate now. Steven Sinofsky has a good post about it here. Eject USB drives – Improved because it seems when I eject from Win8, it actually works. Small but annoying little feature that helps me. App Snapping – I didn’t think this would be useful for me but it has been. So far, I’ve only tried it with the MetroTwit and Google search apps. The google search app is cool because you can perform a voice search right from your desktop. Windows 8 is not for everyone. In fact, I’m not saying that it’s the best OS out there (aka, I’d love to spend a few months with a Macbook Air). In fact, I would NOT want to trade in my iPad for a Surface. 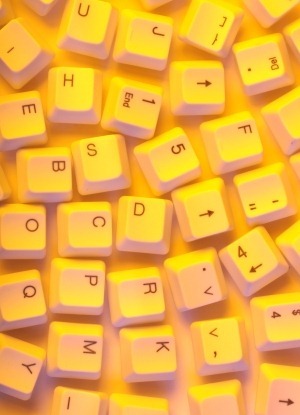 What I am saying is that if you’re like me: a desktop Windows 7 power user who is not afraid of the keyboard. Then, you may want to check out Windows 8. Windows 8 has a lot of minor improvements in the UI and experience that all add up to a good upgrade for my desktop machine. Did I mention the performance improvements? That is my favorite Windows 8 feature. Overall, it’s faster and smoother than Windows 7. And being that I’m a geek, I know how to get around it. So, it’s fun for me. Keep an open mind and try it. Hopefully, it’s fun for you as well. 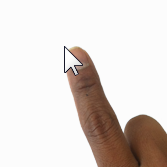 Wouldn’t it be cool to turn the Windows cursor into realistic finger for touch software demos and general fun? That’s what I thought to myself while I was preparing for my latest webinar presentation. I’m not sure if I dreamed the idea or I saw someone do it on a Mac but I thought it would make the demo more interesting if I could pull it off. Luckily, there is a great piece of free and open-source .NET software called PenAttention. PenAttention is a free Windows program that displays a highlight, pencil, or pointer at the location of the pen. It’s intended for use in presentations on a Tablet PC so your audience can see what you’re pointing at on the screen, since most programs show the pen’s location with an eensy-weenie-teenie-tiny dot that is almost impossible to see on a projector screen. For a demo, see the overview video. The sister program, CursorAttention, is designed to run on Windows machines that are not Tablet PC’s. This may be useful if you wish to highlight the mouse location or use a non-active digitizer (e.g. an external tablet). CursorAttention is not exactly like PhoneFinger because it was created for a different purpose. However, by adding one file, we can get the same functionality as PhoneFinger to demo mobile apps on a Microsoft Windows machine. Download CursorAttention and install it. 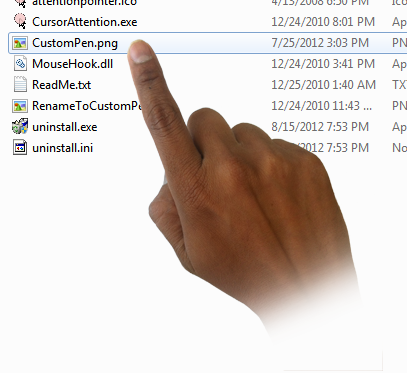 In the CursorAttention install folder, add a file called CustomPen.png. What is CustomPen.png? This is a custom image that is attached to the mouse cursor. 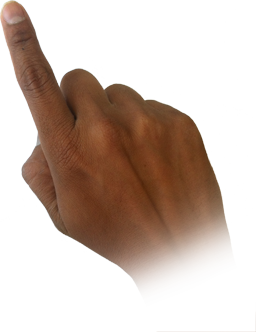 In our case, we’ll want a PNG image of a hand with a pointing finger. It didn’t actually look like that. The picture above is the final product after my friend Drew used his mad Photoshop skillz to create a transparent background and clean up the image. I simply took that image above and dropped it into the CursorAttention folder and renamed the image CustomPen.png. That’s it. Now, run CursorAttention. Right click on the system tray menu. I had a lot of fun using CursorAttention and found that the hand cursor really helped the viewers to better visualize iPad touch apps when demoed from Microsoft Windows. At the tip of the finger, it kept the native Windows cursor too which ended up overlapping on top of the finger. Here’s an easy workaround, use these free “Small Dot” cursors. They are small enough not to overlap. Simply download and install them. Unfortunately, you have to manually set each cursor in windows. However, once that is done, you have a tiny dot that is hardly noticeable with the main finger cursor. Try this solution the next time you have demo mobile app on Windows and would like to use a hand/finger cursor. Then leave me a comment below with your thoughts. Thanks. At my day job, I write a lot of demos for videos, webinars and basically to help customers/developers. And the number one source of data used for these demos? Northwind. Great set of various data to bind to different things like grids, reports, and charts. It is used by many Microsoft samples. Available for SQL Server and Microsoft Access. So what’s problem? It’s a bit boring to always use the same set of data. In fact, Scott Hanselman even tried to stir the community with a call to action to come up with sources other than Northwind. That was back in 2008 and unfortunately, not many other sources were offered. So, I’ve scoured the internet and below are several resources that I’ve found. Warning: You may need to “clean-up” this data. And you may also need to import it to your database of choice. Good news, it’s easy these days to find interesting sources of data. And for free. If you’re willing to dig around and clean up some of the data, it’s right there for the taking. FreeBase.com Freebase is a large collaborative knowledge base consisting of metadata composed mainly by its community members. Amazon Web Services offers some public data sets as well. Though you will need an Amazon EC2 account. Do you have other sources of data? Drop me a note below. Thanks! Issues that are fixed: We have fixed several bugs in this hotfix. All bug fixes are listed below. Source editor freezes for a few seconds when typing in a page with a custom control that has more than two levels of sub-properties. “View Code” right-click context menu command takes a long time to appear with web application projects. Visual Studio has very slow behavior when opening large HTML documents. Visual Studio has responsiveness issues when working with big HTML files with certain markup. The Tab/Shift-Tab (Indent/Un-indent) operation is slow with large HTML selections. Slow typing in design view with certain page markup configurations. Quotes are not inserted after Class or CssClass attribute even when the option is enabled. Visual Studio crashes when ServiceReference element points back to the current web page. Build is very slow when Bin folder contains large number of assemblies and .refresh files with web-site projects. Our ASPxMenu Suite sports some very cool features for a Web Navigation tool. Of course there are the standard menu things like root/sub menus arranged in a variety of ways. This image collage from the ASPxMenu home page shows off our Menu’s fine capabilities. The new Ribbon Toolbar is certainly very slick and probably a nice way to spice an application. In fact, we currently (and beautifully) support this Ribbon Bar with our own version for both WinForms(XtraBars) and VCL(ExpressBars 6). Although this doesn’t help us ASP.NET guys much. Luckily you can use our ASPxMenu Control and with some simple setup, turn it into a Ribbon-like toolbar. Now this is not a complete look and feel of the Ribbon control, however, it is a simple one with our control. *NavigateUrl items changed for this post, underscore not necessary after j. After binding to the XmlDataSource and setting up some of the properties of the ASPxMenu we get a decent looking toolbar. 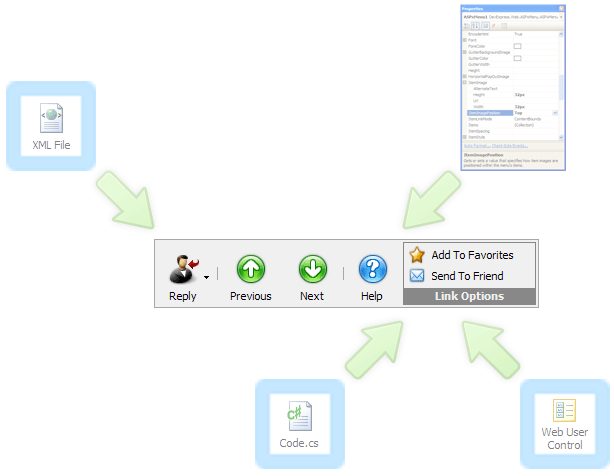 You can see this toolbars feature also in our online demos. Looks like the Visual Studio 2005 SP 1 has been released. "We released Visual Studio 2005 Service Pack 1 earlier today. This Service Pack addresses a range of issues that were found through customer and partner feedback as well as our own internal testing. Many of these issues were reported by you and I thank you for taking the time to report them to us. The release also adds a number of customer requested functionality and enhancements to some of the most common development scenarios to Visual Studio that I think you’ll find interesting and valuable. For developers using Windows Vista we also released a beta of the Visual Studio 2005 SP1 Update for Windows Vista. You can find out more about both of these releases here."